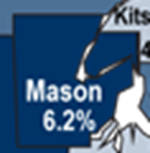 Mason County’s unemployment rate dropped slightly in last month. According to the Washington Department of Employment Security, the County’s unemployment rate in June was 6.2 percent. That’s down one-tenth of a percentage point from May’s revised rate of 6.3 percent and down one-tenth of a percent from June 2017. 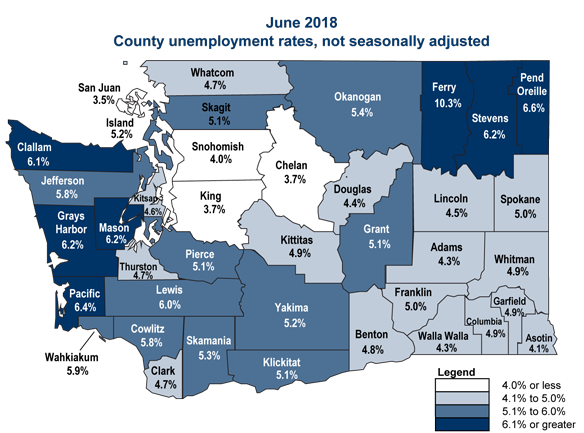 Adjacent counties saw similar declines in unemployment with the exception of Kitsap (4.6%) and Thurston (4.7%) counties which showed no change from May to June. Jefferson (5.8%) and Pierce (5.1%) counties saw drops of one-tenth of a percent. Lewis County’s June unemployment rate was 6 percent – down two-tenth of a percent. And Grays Harbor County saw a drop of three-tenths of a percent last month.